The MMA action continued at UFC Fight Night Hidalgo on FS1 tonight (September 17, 2016) with lightweight wrestlers Chris Wade and Islam Makhachev. The southpaw Makhachev opens with a high kick but he doesn’t have the range. Wade lands a low kick in return, but gets a straight left that back him up for his trouble. Makhachev then hits a front kick that pushes the American back to the fence, and he immediately changes levels for a double-leg. Wade tries to counter with a guillotine, but Makhachev walks up his legs into mount and pushes Wade to his back. Wade reclaims half guard. The Russian goes for an armbar, but loses position and Wade gains top position. The Khabib Nurmagomedov training partner immediately throws up a triangle and threatens with it for several moments. Wade is defending but the choke looks like it is slowly tightening. The Long Islander retaliates with hammerfists, and ultimately escapes the choke. Setting up in Makhachev’s half guard, he lands some moderate ground and pound as the clock ticks down to zero. 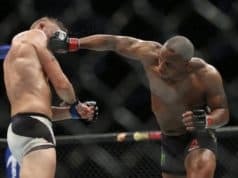 The two lightweights throw kicks that fail to land. Wade flicks out a couple of jabs. He then runs into a Makhachev left hand, and the Russian follows up by immediately dropping for a takedown. Wade again goes for the guillotine and it seems tight, and he rolls into top position. But Makhachev escapes and regains top position. An ensuing scramble sees the process repeated: Wade looks for the guillotine, but Makhachev escapes and gets top position. Makhachev grinds on Wade and advances to side control, then takes his back. The former NJCAA national finalist fights off the second hook, and gets a hold of one of Makhachev’s legs. As Wade transitions to a double-leg attempt, Makhachev reverses him and threatens with back control. The Russian floats on top as Wade scrambles beneath him. As they get near the fence, Wade is able to grab a leg and attempt a heel hook right before the end of the round, but the bell rings. Wade comes out southpaw for the final round and throws a head kick, then switches back to orthodox. Makhachev sticks him with another left hand and takedown attempt. Wade looks for the switch against the fence, then switches to a kimura sweep. He briefly gets mount, but Makhachev is able to use butterfly hooks to elevate and reclaim the upper hand. Wade again tries for a guillotine, but he doesn’t have it as tight this time. The Russian gets to mount, but Wade immediately bucks him back to half guard. 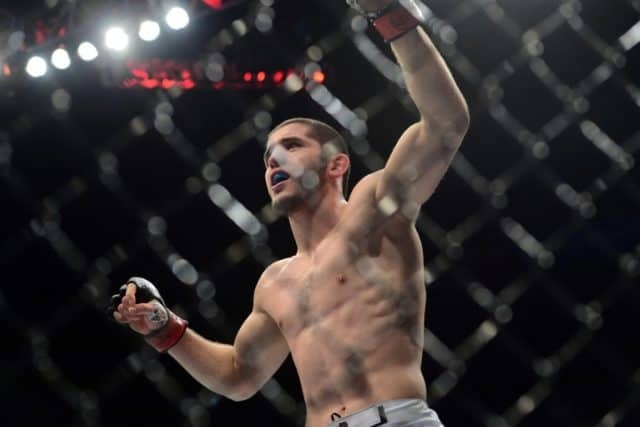 Makhachev is suffocating on top. Wade has done a good job scrambling, but the Dagestani is always a step or two ahead. Makhachev gets back mount and slaps on a body triangle with two minutes left in the fight. Wade is clearly tired but is still defending. The American rolls to the side of the triangle and tries to spin into Makhachev’s guard, but to no avail. Wade fends off the final choke attempts, and there’s the horn to end the fight.